With the rise of healthy eating, quinoa has taken center stage as one of the most popular superfoods on the planet. Since this ancient grain, which originated from the regions of Peru and Bolivia, is so versatile, I try to incorporate quinoa into mealtime whenever possible. One of my favorite ways to use quinoa is at breakfast. It’s a refreshing change from the usual dull breakfast grains made famous by cereals like Cream of Wheat and Oatmeal. The thing I love most about quinoa is its versatility. It’s creamy and nutty, yet takes on the personality and flavors it is paired with. 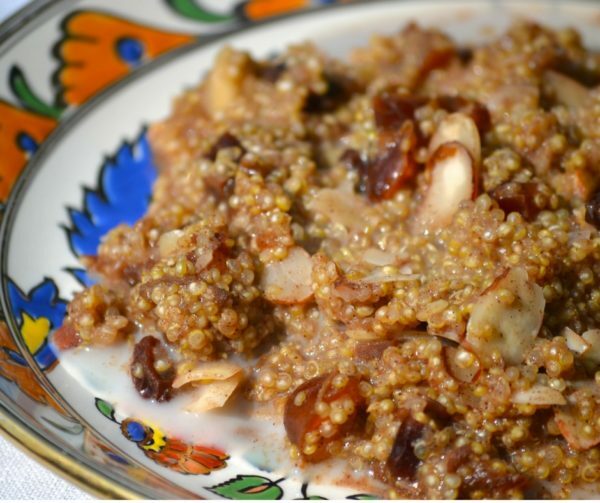 In this recipe, the combination of cinnamon, crunchy almonds, sweet Medjool dates and honey, a pinch of salt, and a splash of almond milk create a nutritionally dense, flavor-packed dish that is perfect for breakfast but makes a delicious mid-day snack too. Find the recipe at the bottom of this post. To learn more about the history and nutritional benefits of quinoa, check out the video below. In medium pan, heat the cinnamon and quinoa together until warmed. Add milk and salt, stir until well blended. Bring to a boil and reduce heat to low. Cover and simmer for 15 minutes. Stir in dates, honey, and almonds. Pour into bowl and top with additional almond milk and your favorite fruits.